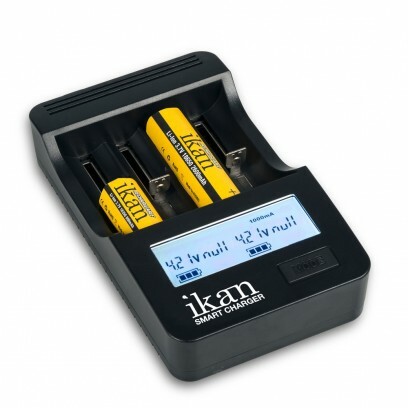 The ikan ICH-SC4 is a four-bank battery charger designed for the rapid charging of rechargable 1.2V NI-MH/CD (AA, AAA, SC, C) battiers and various sizes of 3.7V Li-ion battery. It's integrated microcomputer determines proper battery type and voltage requirements to assure a safe and proper charging cycle. While the charger is in use, two different styles of batteries may be charged simultatenously. THE ICH-SC4 features a high-contrast, back-lit, LCD screen for monitoring battery data and current charger settings. A selectable charging current allows you to charge your batteries at your desired mA setting (push buttong selection between: 300, 500, 700, 1000 mA). For your protection and convenience this charger features over and under charge protection, short-circuit protection, bad battery detection, and reverse charging protection. Shipping Weight (Metric): .45 kg.